Defender Michael Keane was proud of Burnley’s unrelenting attitude after battling with 10 men against Watford. The England international suggested that many teams may have crumbled when falling two goals behind with a man less but the Clarets demonstrated their most valuable traits as they stuck together and fought until the final whistle at Vicarage Road. “We never give up and that’s the attitude that you need at this level,” he said. “No matter what goes against you, you’ve just got to keep going. It could quite easily have been a long day for us today, being 2-0 down with 10 men, it could’ve been four or five if we weren’t on it mentally, so we’ve shown how strong we are as a group and we’ll fight until the end every time we step on that pitch. Sean Dyche’s side lost Jeff Hendrick in the sixth minute as the former Derby County midfielder received the first red card of his career and then trailed at the interval with goals coming from Troy Deeney and M’Baye Niang. 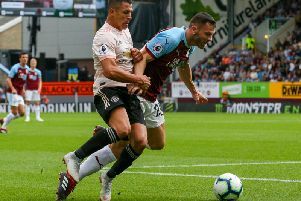 Burnley battled back after the break as Ashley Barnes netted from the penalty spot but they couldn’t find a way past goalkeeper Heurelho Gomes for a second time. “I thought we were unlucky today,” said the 24-year-old. “Obviously one of those decisions early in the game has gone against us. I’ve not seen it back so I don’t know if it was a red card or not. “We weren’t pleased to concede a few minutes later. It’s a good cross from the lad and a good header, as was the second goal, but I thought the lads responded really well. “The manager told us at the end how proud he was of the performance. I feel that if we’d have kept 11 men on the pitch and played like that we would’ve got something today. The Clarets have yet to win on the road this season having taken one point from 11 fixtures away from Turf Moor.